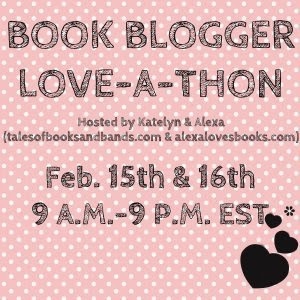 I am so excited to be participating in the Book Blogger Love-A-Thon! This is my first time joining in on the fun and I cannot wait to see what these two days will bring. I hope you all are joining in on the fun and are participating as much as possible. Click the photo above to be taken to one of the hosts, Katelyn, page to find more information on this event. 2. What genre/subject matter do you read and review most on your blog? The genre that I read and review the most in Young Adult, but I am starting to get more and more into New Adult. The subject matter that I mostly read is definitely paranormal, but I do like to change it up a little and do some contemporaries every now and then. 3. Name the 3 books you're excited for in 2014! 4. Where in the world are you blogging from? 5. Tell us -- how did you get into blogging in the first place? Well, it started back when I had a MySpace. I post in their little "blog" area my thoughts on books I just read as suggestions to others on what they should try. That didn't really satisfy me so I got a LiveJournal and started posting reviews on there and then I found the book blogging community with that. I didn't realize that there was this big of a community out there all having the same interest in books and fell in love. LiveJournal still didn't satisfy me, because then I started reading on these blogs with awesome names and layouts and what not so I got on Blogger and haven't been happier sense. This was seriously the best thing I have ever gotten into. 6. Apart from reading, what other hobbies/interests do you have? Besides reading I love watching TV, especially shows that originated as books series. I also really love to crochet and am still a beginner at it so I am slowly learning how to do more and more with that. I am a full time student at a University so I am busy with school, plus I am in a sorority so I also have a lot to do with them and then I am engaged so I also make a lot of time for him lol. 7. If you were stuck on a deserted island, which books would you bring with you? I would bring the Twilight saga, The Hunger Games trilogy, Catcher in the Rye, all of Jennifer L. Armentrouts books, all of Melissa De La Cruz's books, my kindle (if that counts), and probably buy all of the books in the mortal instruments series so I could finally read those. 8. If you were stuck in some dangerous situation (like a fire, a sinking ship, a warzone), which book boy or girl would you want to come and save you? Katniss Everdeen please come save me! She is such a badass and I think she could save anyone from anything. 9. You’re attending a party with your friends. Suddenly, the DJ changes the song and it’s YOUR song – what song would that be? "Blurred Lines" By Robin Thicke I can't help but dance when I hear that song. 10. What 3 movies would you love to have your favorite author write into books, or vice versa? I hope you enjoyed getting to know me! Have fun learning about all the other people participating in this event and make sure to check out the giveaways and what not that will also be happening these next two days! That is an awesome way to come up with a name, not to mention an awesome blog name! I'm so pumped for Split Second!! I just finished Pivot Point recently and LOVED it! I remember seeing LiveJournal and thinking I would like one, but when I signed up, I realized I didn't have a whole lot to say! I never thought of using it to write down my feelings for books. And I really need to read something by Jennifer Armentrout; I feel like the only blogger left who hasn't read at least one of her series!